For those of us who are clinicians and researchers in HD who happen to come from HD families, today was a special day. Today was the day that all of the science over the past few days of HSG 2015 comes together. Today was the joining of science and research with the families who are on the front lines of HD. These families are the pioneers. They are the warriors. They are the champions. They are the ingenious ones who have figured out how to “hack” Huntington’s. These families make it possible for scientific research to take place. For some HSG participants, these families are why we are here. In the middle of talking about mesenchymal stem cells, brain-derived neutrophic factors, antisense oligonucelotides, small interfering-RNA, and adenoviruses, these Huntington’s hackers have figured out how to make it work. On all sides of the HD spectrum – researchers, clinicians, psychiatrists, social workers, geneticists, neuroscientists, drug developers, people with HD, children at-risk for HD, the gene positive and the gene negative, the caregivers, the loved ones – on all sides we came together on this family day to involve each other, to learn, and to share. We shared our commitment to the care of HD. We shared promise. We shared hope. A special thank you to the HDSA Central Florida Affiliate for its hard work organizing HD Family Day! FDA wants to hear from you! 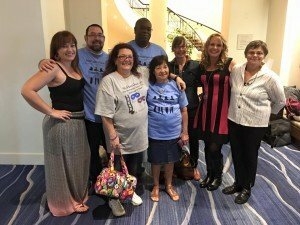 There’s still time and opportunity to tell the FDA your thoughts on drug development for Huntington disease! The FDA focused on hearing from individuals with HD, family members and caregivers at its Sept. 22 Patient Focused Drug Development hearing. But from now until Nov. 23, the FDA is taking input from the entire HD community, including care providers and researchers. Specifically the FDA wants to know: At all stages of HD/JHD, if a treatment could be developed, what symptom would you most like to stop or what ability would you like to regain – what is most important to you? The other topics about which the FDA is gathering input include the symptoms that affect daily life, how the disease affects social interactions and relationships, and how treatments have changed over time. To see the full list of topics, click here. This is your chance to advocate on behalf of HD families and underscore with our country’s drug development process how imperative it is to address the many symptoms of HD. Please take advantage of this opportunity. To submit your comments, click here and then click on the green “Submit a Formal Comment” button on the right side of the screen. This year has brought several films and books about Huntington disease. Lisa Genova’s Inside the O’Briens, a novel about a family that discovers HD runs through it, published in April, and Lucy Walker’s The Lion’s Mouth Opens, a nonfiction short film following a young woman finding out whether she carries the gene that causes HD, aired on HBO in June, and WeHaveAFace.org launched its documentary project detailing the impact of HD, The Huntington Disease Project: Removing the Mask, in June, as well. 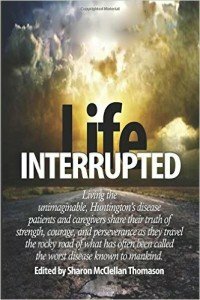 Now, our partners at Help4HD International, Inc., have published Life Interrupted, the stories of 12 people with HD and their caregivers. The stories detail the impact of living with HD on those with the disease and on everyone else around them. Living the unimaginable, twelve Huntington’s disease patients and caregivers share true stories of struggle, devastation, and life-shattering events as they travel the journey that is HD. Along the way, you’ll meet ordinary people who develop extraordinary strength, courage, and perseverance as they try to counterbalance the chaos of lives falling apart as HD shows up like an out-of-control wrecking ball. One woman struggles for years to find her biological family, then discovers more than she expected. Agonizing parents watch helplessly as their children endure years of pain, lose every bit of their quality of life, and die far too soon, some from the juvenile form of HD. Couples fall in love, marry, and start their families just in time for this horrific disease to step in and rip everything away, eventually taking their soulmates’ lives and leaving them with the knowledge that their children, too, may face the same terrible fate. Witness the strength of these families as they rise to the challenge and advocate to be the last generation ever to live with the horrors of Huntington’s disease, a genetic neurodegenerative disease that has often been called the worst disease known to mankind.